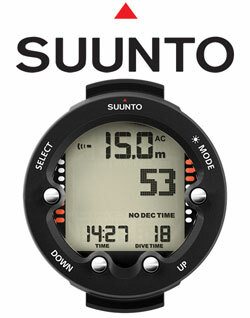 The ZOOP Novo dive computer from Suunto is a wrist-mounted computer that will not only enhance your time under water; it will also help you be a safer diver without breaking the bank. Its ability to operate in two modes (Air and Nitrox), safety features (decompression stop data, audible alarms, and easy-to-read display), and simple menus mean the ZOOP Novo will provide critical dive data when it is needed quickly and accurately. It employs the reduced gradient bubble model (RGBM), which is an algorithm developed to calculate decompression stops; this algorithm is a model used to determine how much gas is accumulated during a dive and how much time is required at your safety stop(s) to safely surface.